If you’ve found your way to my website, it’s probably because you’re at least a little bit concerned about the danger that EMF radiation poses. You might know that devices like cell phones, laptops, tablets, smart meters, and cell towers all emit an enormous amount of EMF radiation, but you probably haven’t thought about the EMF radiation simple home appliances like a hair dryer can emit. That is why I’m writing this Chi Pro Low EMF hair dryer review. Not only is the Chi Pro one of nicest ceramic hair dryers on the market, but it also prides itself on low EMF emissions. 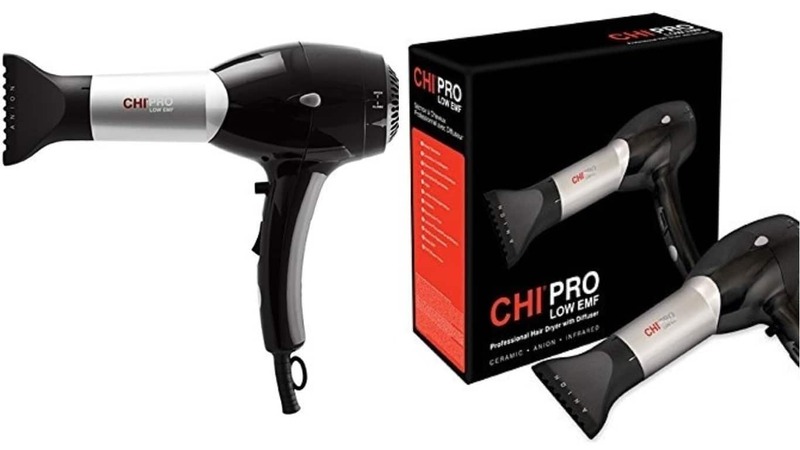 I featured the Chi Pro in my popular article “5 Best Low EMF Hair Dryers – And Why It Matters” for a reason, it’s an overall fantastic hair dryer. In this review I want to give you an honest look at how the Chi Pro works, it features, it’s strengths, weaknesses, and reasons you should consider it. Although many people purchase the Chi Pro because of it’s low EMF radiation emissions, they are actually purchasing a fantastic professional grade hair dryer that they will be extremely happy with. It uses ceramic technology for faster drying times that give you less frazzled hair. It has a 1500 watt motor for very fast airflow that won’t harm your hair from excessive heat. Let’s get into the individual features that make the Chi Pro such a fantastic hairdryer. Let’s start off with what might be the most important feature of the Chi Pro, it’s measurably low EMF radiation emissions. You’re probably aware how dangerous excessive exposure to EMF radiation from devices like cell phones, tablets, laptops, smart meters, and cell towers are, but what you might not realize is that simple home appliances like your refrigerator, washing machine, microwave, and yes, even your hair dryer can emit a dangerous amount. The reason that people are especially concerned with EMF radiation from hair dryers, and why I wrote a whole post about it, is the proximity to your head. When it comes to any type of radiation, proximity is the most important factor determining your level of exposure. That is why we use something called the inverse square law of physics, which essentially states that as we double our distance from a source of radiation, we quarter our exposure to it. This is one of the reasons we don’t worry much about the small amount of radiation that comes from simple devices, because they only emit a small amount, and our distance is usually significant. This is also the same reason that the EMF radiation from your hair dryer should be a real concern because we have it so close to our brain for such an extended period of time. I won’t go into all of the symptoms and health concerns that come with EMF radiation in this post, but suffice it to say it should be a real concern. Ok, now back to how the Chi Pro produces less EMF radiation than the average hairdryer. The Chi pro is designed in such a way via it’s ceramic and infrared heating technologies, that it allows for extremely high-quality drying, with a fraction of the emissions. This is a measurably smaller amount, so if you have an EMF meter like the Trifield TF2 at home, you should easily see a significant difference in the emissions. Ok, now that we understand that this is a Low EMF hair dryer, let’s talk about some of the features that make it a professional grade hair dryer worthy of your hair. 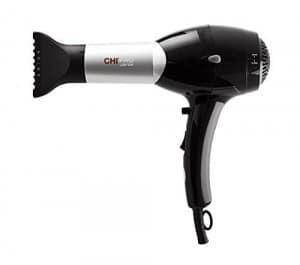 The Chi Pro combines ceramic technology, negative ions, and far infrared to give an unparalleled heating that helps to dry your hair while retaining moisture. Ceramic helps your hair to maintain shine, and the negative ions help your hair to lock in moisture. You don’t often find all of these technologies in a single hair dryer, making the Chi Pro a fantastic choice. If you read through the reviews on the Amazon listing, you’ll see that many people were surprised when they got it to realize it is actually a professional grade hair dryer with features you would only see in a salon. For example, it’s extremely long (11 foot) high-quality cord, or it’s full-color LCD touchscreen display and controls. The touchscreen allows you to control the many low and high power settings to give you an incredible amount of control over the 1800 watts of heat and airflow. There is also a “cool shot” button that you can use when your hair is still damp to help keep it from over-drying. Also, the Chi Pro is extremely lightweight, weighing only 1.5 pounds, it will help people with a lot of hair to dry from fatiquing. The Chi Pro comes with two very nice accessories, including a concentrator, and a diffuser. The concentrator is used to help you direct the powerful air flow to areas of your hair that are usually harder to access. The diffuser is something you’ll often find in professional salons and is used to help style curly and wavy hair just the way you want it. For what you get with this hair dryer, with its professional quality features, and low EMF emissions, it is probably one of the best values on the market. I find it hard to believe that you would regret purchasing this hair dryer, but if you do, Amazon has a fantastic return policy you can take advantage of. 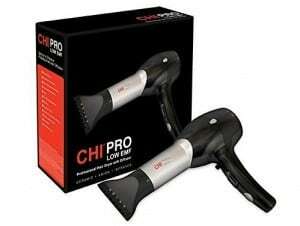 One user said that she just purchased the Chi Pro after having her last Chi hair dryer for 19 years! She is now a lifelong Chi user after becoming completely convinced that these are the absolute best hair dryers you can purchase. After years of looking, another user said that this is the best hair dryer she has ever tried. She mentions that the several technologies including far infrared and negative ion dry her hair incredibly fast without leaving it feeling dried out of frizzy. She also mentions that it is extremely quiet, making hair drying a much more relaxing experience for her. Another customer mentions that low EMF radiation was extremely important to them, which is why they were so happy to find the Chi Pro Low EMF hair dryer. One user mentions that for them, the cord is a bit longer than they would like since it does not coil up. Ultimately I honestly feel that the Chi Pro is one of the best hair dryers on the market, and certainly one of the absolute best low EMF hair dryers, which is why it is included in my full guide on low EMF hair dryers. If you’re curious about what other low EMF hair dryers are available on the market, be sure to check out that post. With the Chi Pro, you are actually getting a professional grade, technology-rich, salon-style hair dryer that you can use at home. If you use your hair dryer fairly often, it is certainly worth spending a few extra dollars to get a high-quality one that you will actually enjoy using time and time again. Farouk, which makes the Chi line or products, as a company has been making high-quality hair dryers and hair products since the mid-1980’s, and they truly stand behind their products, so you know you can as well. My final opinion is that this hair dryer is absolutely worth your money consideration. I hope you found my full review of the Chi Pro helpful, if you did, please consider sharing!